Pictured: Rayford and Monica Jackson with their two children and family members, surrounded by the ACTS team and Mayor Tom Barrett. Featured image courtesy of the Milwaukee Times newspaper. To read more click here. Monica and Rayford Jackson, both Milwaukee natives, hope to close on their home by the end of the month and then take a nice vacation. “Somewhere sunny and tropical,” Rayford said. The couple has been working with ACTS’ Homebuyer Counselors for the past three years to get themselves ready to purchase. However, the home they have in mind isn’t just any home: it’s a family heirloom. The home belonged to Rayford Jackson’s grandparents. 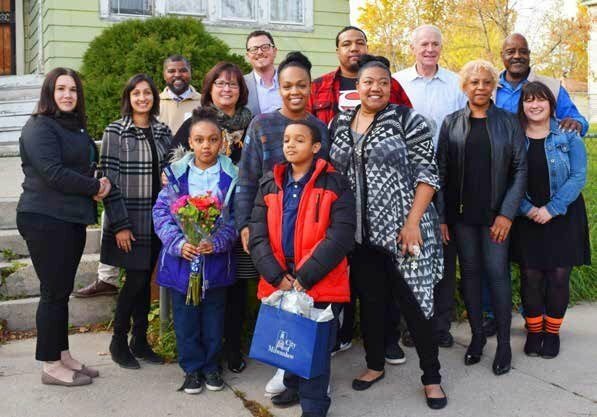 The home went into foreclosure with the city, and the couple was able to occupy it through the City of Milwaukee’s lease-to-own program. Working with ACTS gives the couple an opportunity to bring it back to the family. “Now no one can take it from under us,” Monica said. While they have been living in the home, they have worked to make the house code-compliant and live on the first floor. They have some repairs—both major and minor—to complete including the roof and foundation. “The roof was always a major issue,” Rayford said. He said he wasn’t surprised about anything listed in the scope of work, the list of necessary repairs, for the home. The couple has already been pre-approved for an ACTS rehab loan to help with the cost of the $40,000 rehab project ahead of them. “We’re ready to take on the projects without any hindrance,” Rayford said. They are excited to start pulling permits. The decision to purchase the home was spurred by their children ages 7 and 8.